How long does it take to have the final product installed? Installation varies from project to project because of the potentially different scopes of work. Site conditions also vary from project to project. Once Toledo has generated a proposal for your project we provide you with a time-line of your project. What is the process for contracting with Toledo Iron Works? Toledo maintains constant communication with the client to ensure confidence and peace of mind. Does Toledo provide signed and sealed shop drawings and structural calculations? Yes. Toledo does provide shop drawings and/or structural calculations, if your project requires, that are signed and sealed by a registered professional engineer. What kind of paint/finish does Toledo provide? Toledo provides TGIC Polyester powder coat finishes on all exterior aluminum applications. On steel interior applications we use a self-etching grey primer and then two to three coats of paint. Does Toledo work with Interior Designers and Architects? Absolutely! We are proud to say that Toledo Iron Works in one of the most sought out sources for ornamental metals for top architects and interior designers. We are very creative and value the importance that a true professional architect or designer can have on a project. Toledo Iron Works’ experience and innovations have served as a catalyst to ensure that many architects’ and designers’ visions remain intact during the design and manufacturing process. Please call us today and let us know how we can help with your project! What warranty does Toledo offer? Toledo offers a one (1) year warranty for all products provided they have faulted due to normal wear and tear. If a product is damaged by another party, Toledo will work with the client to resolve the issue as quickly and as cost efficiently as possible. I am in a hurry can Toledo meet my deadline? Toledo has a fast track option available for a premium. We will meet and discuss your projects needs, determine a timetable and stick to it provided all communications are received as quickly as they are initiated. See our “On-time Delivery Guarantee” section for more information. Unlike true wrought iron or authentically hand forged metal work, stock components are usually manufactured with mass production machinery. Some of these products appear pretty bu they lack the soul and refinement that true wrought iron or “hand forged” metalwork imparts. It comes down to whether you the real thing or a machine produced imitation. What materials does Toledo work with? Toledo Iron Works is well versed in working with iron, steel, stainless steel, bronze, brass, and copper while incorporating glass and wood. Over 40 years of experience allow us to turn these raw materials into impressive railings, stairways, driveway gates, and entry doors (to name a few). Design can vary from traditional wrought iron, to dazzling stainless steel rails incorporating glass and wood accents! I live outside the US, do you ship overseas? We are very proud to say that our work has been shipped to all parts of the globe; from New York to California to South America and everywhere in between. We’ll work with you and your logistics company to make sure your work of art reaches its final destination on time! I’m not sure what design I want, can you help? Toledo Iron Works’ renowned design team is “seasoned” with experience in design variations from clean and stylishly contemporary to intricate and detailed Mediterranean. We will meet with you for an initial consultation and gather as much information as possible. After, we’ll work with you, your designer and or architect to produce the look you imagine. Call for more info! 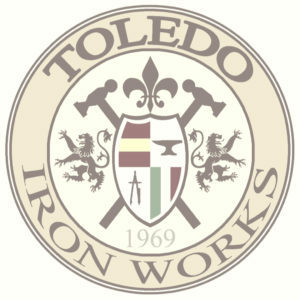 Why are you called "Toledo" Iron Works? Part of our family, over five generations ago, were originally from Toledo, Spain. A renowned city for its armor, swords, and blacksmiths. It served as a tribute and an honor to name the company to live up to such a legacy in the ornamental metals world. Does Toledo produce mass production pieces? With out a doubt! We have produced product display stands, agricultural carts, chairs, custom center pieces for special events and several other commissions! Call us today to setup your initial consultation.